Chef Daniel Sergi, a Middletown resident affectionately known as “Surge”, is a professional chef with a range of culinary experience. Chef Sergi is a Navy Veteran that worked his way through culinary school via the Montgomery G.I. Bill. He first started in the kitchen at the age of 26 at Pistol Creek Golf Club in Berlin, Connecticut. During this time, he attended the Center For Culinary Arts in Cromwell. There, Chef Sergi gained not only the book knowledge of classic French and International cuisine, he also gained respect from his peers, who elected him Sous Chef of his class. He ultimately finished at the top of his class at the Center For Culinary Arts. Chef Sergi continued his work at Pistol Creek earning the title of Sous Chef before moving on to further hone his skill and speed on the line at the Hideaway in Old Lyme. After his tenure there, Chef Sergi assisted in the opening and the running of Basta Trattoria in New Haven, an award winning restaurant. There, under the tutelage of Chefs Claire and the late Frank Criscuolo, Chef Sergi learned the ins and outs of operating a scratch kitchen and using organic and sustainable foods, working closely with amazing, fresh ingredients, all the while, bolstering his knowledge of authentic Italian cuisine. Chef Sergi spent 9 years at Basta helping to build a solid, loyal customer base that would repeatedly dine to enjoy its award winning food. Basta was rated by the New York Times, won the title of Connecticut’s Best Meatballs three years in a row, was named as the Best Trattoria in Connecticut, and was listed as one of America’s 1,000 Top Italian Restaurants by ZAGAT in 2008. Chef Sergi was also hand selected to participate in the 2010 Elm City Iron Chef competition where he finished as the runner up. After Basta, Chef Sergi became Executive Chef of Esca Restaurant and Wine Bar in a return to his Middletown roots so he could be closer to home and his family. 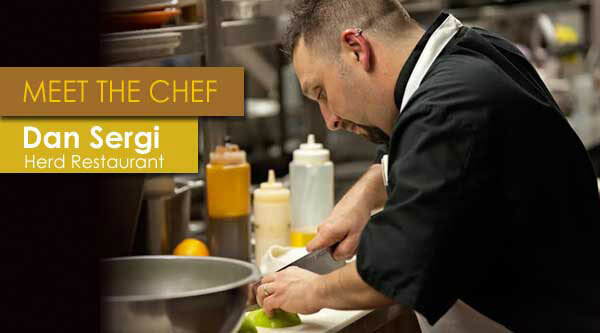 At Esca, Chef Sergi was responsible for the management of its high volume and upscale kitchen.